Al Fin Energy: Biomass to Gasoline at Costs of $1.95 / Gallon? 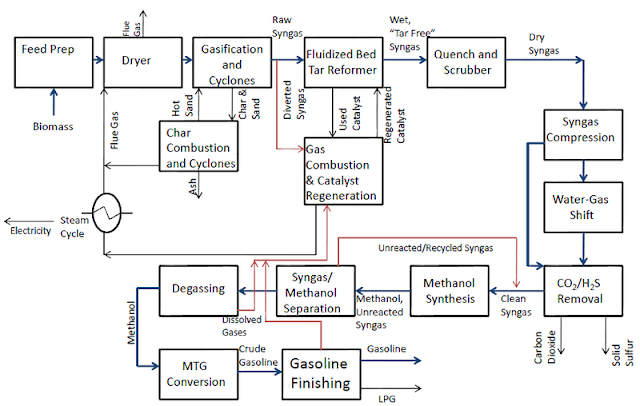 The US DOE National Renewable Energy Lab is reporting that a biomass-to-gasoline process utilising gasification with methanol as an intermediate, could be as economical as current bio-ethanol production. The reason that Al Fin Energy puts so much focus on liquid biofuels, is because renewable liquid fuels will eventually place a price ceiling on petroleum fuels. Biomass to liquids (BTL) is a renewable process which can continue as long as the sun shines and biomass is produced. The greatest threat to BTLs is a new ice age. The greatest promise for BTLs is a warming climate, with higher temperatures and CO2 levels. It is important for forward looking individuals to understand how much profit to expect from investments in expensive fossil fuel ventures, before a dropping price ceiling makes them unprofitable. Peak oil doomer nonsense -- and associated expectations of eternal profits from petroleum and fossil fuels -- will only break your bank.